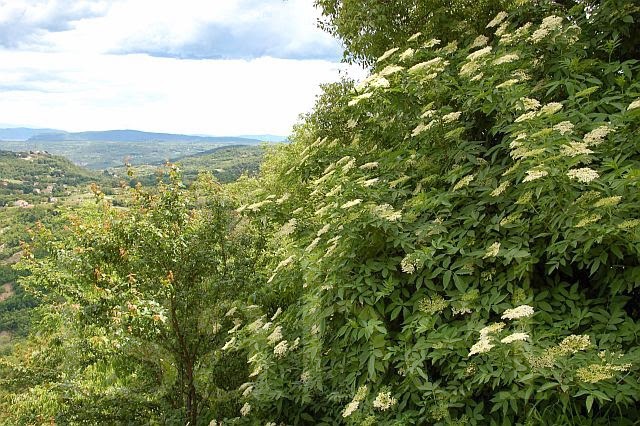 It’s that time of the year when the sweet smell of elderflowers is in the air as the elder trees bloom. Called bazga in Croatian, this tree is more like a large, tall bush, and the flowers appear in large clusters of delicate white flowers. The flowers are used to make a syrup, and so are the small dark berries which appear at the end of summer. But I prefer making it with the flowers – diluted with water this is one of my favourite drinks. 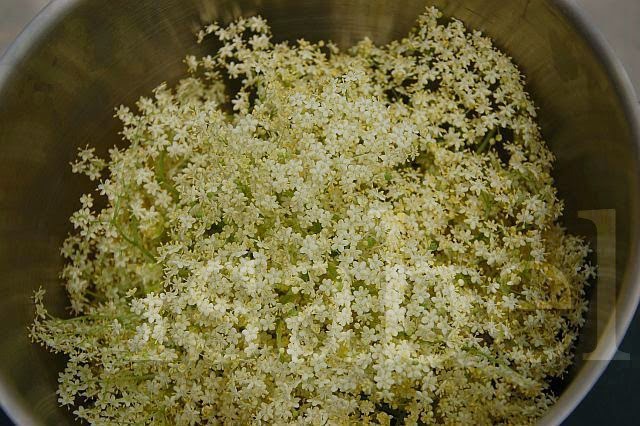 The delicate and subtle smell and taste of the elderflower is hard to describe, but there’s nothing else like it. So this week I made 9 litres of elderflower syrup, hoping this will be enough to last for the months to come. It’s especially refreshing mixed with fizzy water. Sometimes if I feel like I’m coming down with a cold, I like to pour the syrup in a cup of hot water and drink it hot! Pick large heads of elderflower where all the buds have opened. Some can be infested with small insects so avoid those. Shake off any flies or insects and place the flowers in a large bowl or pot. Pour in 3 litres of water, cover and let stand for 24 hours. The next day, remove the flowers and strain the liquid into a large pot with a five-litre capacity. Use a fine sieve to filter the water, or a dishcloth. Heat the liquid until it is hot but not boiling. Add the sugar and citric acid and stir until these completely dissolve. Pour the liquid into glass bottles and seal. Isabel, I've always wondered what the Elderberry looks like. I've tried sodas, syrups that are flavored with it. It's a bit sweet for my taste, but I love that you included a recipe. Great post! Hi Corinne, thanks for stopping by! These are the flowers of the elder tree. The berries come later, around late August. Elderberry syrup is also very good but I prefer the syrup made with the flowers. I also found making the syrup with the berries a very messy job! This sounds amazing - I wish I knew what it tasted like! Those types of recipes that are passed down through generations are often the best ones. Those flowers look lovely, too! I hope you get the chance to taste some Lauren! How wonderful! I am just about to post a recipe I was given and I was searching to know if it was called syrup or cordial and I happened on your page. YOUR PHOTOS ARE GORGEOUS!! Well done Isabel, just beautiful. Thank SJ! Yes, it's also called cordial. I have to make more because 2 litres have disappeared already and I gave one away. If I want our stock to last until winter I have to make a few litres more while the flowers are still in bloom! Yes, you can see the flowers all over Europe. I also used to make the syrup when I was living in Belgium. They also give off a sweet perfume. I remember when we were living in Brussels, the cat used to come home smelling of elderflower! 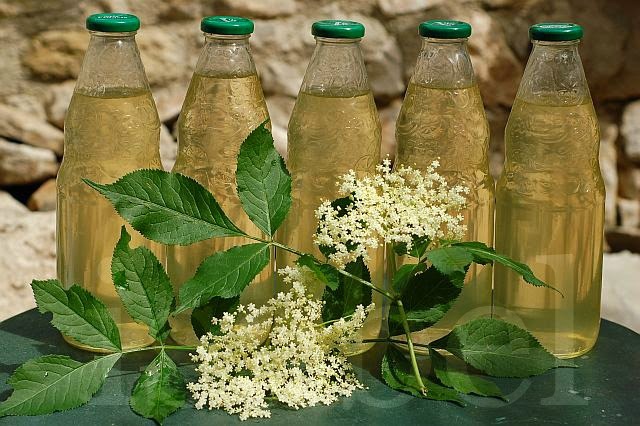 I found your recipe for elderflower syrup, it was so simple and it came out absolutely delicious. My family has been enjoying it mixed with and poured on all sorts of things one of our favorites was frozen as a sorbet, thanks for a great recipe. I love your posts. Hi Lillian, I'm glad it was such a success! Please tell me how you made the sorbet. This is an idea I have too but haven't tried yet. Oooh, I'll try that, thanks!